Restore moisture and revitalise skin with this 100% Certified Organic Rosehip Oil with a minimum concentration of 80% essential fatty acids (Omega 3,6,9) for optimal skin health. Antioxidant and vitamin rich to help nourish and hydrate, protecting the skin from the effect of environmental elements, preventing signs of ageing and helping to reduce the appearance of wrinkles. Rosa Canina (Rosehip) Seed Extract+^, Rosmarinus Officinalis (Rosemary) Leaf Extract+^. After cleansing apply 3-4 drops and gentle massage into face, neck and decolletage prior to moisturiser. Use twice daily. 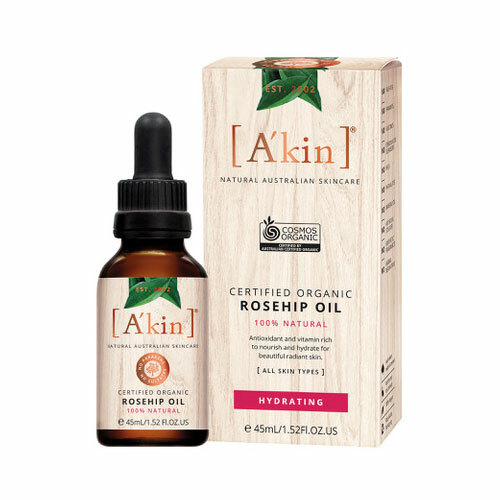 Below are reviews of A kin Certified Organic Rosehip Oil - 45ml by bodykind customers. If you have tried this product we'd love to hear what you think so please leave a review.